A tour across the aesthetic landscape of Matthew Monahan’s figurative sculptures, prints and drawings would make stops in the caves of Lascaux, at archaeological digs in peat bogs, sealed tombs of ancient Egypt and Babylon, Easter Island and the temples of Greek and Roman antiquity – not to mention contemporary Japan, Amsterdam, China and Los Angeles. Through his travels, both actual and academic, Monahan has developed a visual patois that borrows representations of the human face and body from a hundred visualizations of the Other. He also adopts the presentation techniques of Western museums displaying the relics of such cultures. Bodies (and parts of bodies) perch on plinths or are arranged in glass cabinets. However, his is a museum of imbalance, restless- ness and momentum. 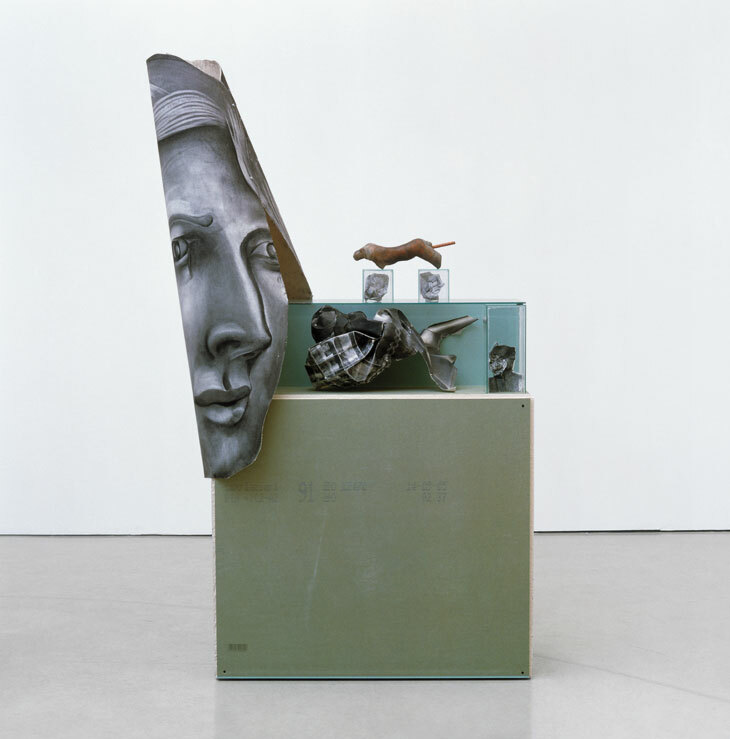 Figures recline on, fall off or are imprisoned within their unfinished plasterboard vitrines and pedestals, wrestling, propping up or otherwise focusing their attention on neighbouring sculptures in the room. This ongoing evolution of inanimate objects takes place in a very literal way; Monahan regularly recycles, adapts or amalgamates elements of works made months or years previously. For an exhibition at Anton Kern Gallery in 2005 all the works were dated 1994/2005, years that book-ended the period between Monahan leaving college and installing the show. ‘Most things live a long time in the studio,’ he says. ‘They grow in a tough neighbourhood, get tattoos and scars. They collect things around themselves, and form gangs.’ Like a distant parent encouraging his offspring to develop a sense of independence, he treats his objects with a certain roughness until he feels that the figures have become autonomous characters ready to leave his care. A result of their ascent through Monahan’s school of hard knocks is that they wear on their often colourful surfaces the bruises of former skirmishes. The artist favours materials that are soft and unstable: paper, foam, charcoal, pigment and, particularly, wax, which accrues dust and dirt as well as marks from physical pressure. In drawings such as Orio (1997) smudgy fingerprints surround delicate draughtsmanship, while sculptures that are blessed with boldly coloured pigments or silver leaf (Helios, 2005, or Virtually Pain Free, 1994/2005) also find their skins cracked and flaking. In short, they reek of mortality and decay. Something about them, however, kicks against the finality of death. Their attitudes, though frozen, seem to have been arrested in the midst of a vigorous mode of living that perhaps only resumes once the gallery lights have been switched off. In The Benjamins (2005) three incomplete bodies scamper around gleefully holding detached parts of their anatomies, while in other works faces glower, frown, smile or weep. In sculptures such as Bob (2006) orYesterday’s News (1994/2005) swirls of floating fabric stand stiffly as though captured in a three-dimensional photograph. The exact nature of the narratives that we have presumably stumbled on, however, remains as inscrutable as the works’ frequently enigmatic titles. There is a sense that only Monahan himself, their maker and master, is party to the complex secrets of their lives. Monahan, however, is at best an ambivalent creator. His figures live in a tormented world of imprisonment and constraint. Glass vitrines become cages or bisect figures from parts of themselves, as with Sweet Grunt (2005), in which one unfortunate fellow finds his left leg and left side of his torso detached from his body and encased in two stacked and sealed glass boxes. Others are marooned on too-small plinths, bound or hung by rope, or, as with Liberator’s Retreat (2006), pierced with spikes through their face and body. While contributing to the psychologically fraught atmosphere, many of these cruel inflictions moonlight as the results of decisions made in the process of making objects stand up, balance and hold together; a necessary evil, as it were. Monahan’s work speaks of long days spent in the studio pulling and pushing materials into new forms and combinations, consumed in traditional sculptural concerns about volume and weightlessness, surface and substrate, and giving life to inanimate substance. He knows, however, that these objects become interesting as art only if they can speak about this process with self-awareness, staying alive by remaining conscious of their own pasts and potential futures. Consequently, his sculptures always seem to threaten to collapse back into formlessness, incorporating unidentifiable lumps of ‘stuff’ – wax, foam or screwed-up pieces of paper – which simultaneously give them the appearance of disintegrating and being in the process of ‘becoming’. This is particularly true of the faces and masks he makes from folded or crumpled paper, such as Riker’s Island (2005), which exist in anxious awareness that a couple of tugged corners would send them back into two-dimensionality. For Monahan, who describes himself as ‘the court painter and the vandal’, the process of creation is not so much a battle as a negotiation with entropy, reasoned through erasing, breaking, repairing and combining rather than conjuring something new from the ether.